Comment: was this the real 1st appearance of Spider-Man? Comment: Thank you very much Rangerhouse, love this ultra-rare Wolverton Sci-Fi. 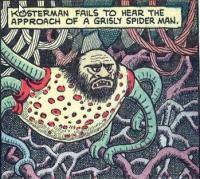 By the way I think it is a depiction of Spiderman as he grows much older & becomes bitter and disillusioned with his ever-mutating spider-like characteristics. Notes: On sale date from the publication date found in the Catalog of Copyright Entries, Part 2, Periodicals, New Series, Volume 34, 1939, Number 4. Second class periodical. Copyright number 435647. Foreword, Introduction, Preface, Afterword (1 page) Meet the Artist Who Draws "Speed Centaur"
Synopsis: Jane's cousin has his eyes set on total control over a steel mill and makes Jane look bad by disrupting work in the mill in order to slow down production and gain control. Synopsis: Having been spurned by Joan, Barry and Frogga leave on a luxury cruise to Hawaii to get their minds off the lady, unaware that Dorian is also going through bad emotions over Barry as well. Meanwhile, Dacia and General Kyota plan to ship a highly corrosive acid (mixed with oil) to where the U.S. Pacific Fleet is stationed, intent on destroying it. Synopsis: Nick Nelson and Kodi pursue "notorious space bandit" Owen Kosterman to the jungles of Venus, and encounter a couple of couple of cannibalistic spider men. Synopsis: An uneasy truce is in place after Queen Dagmar is ousted as leader of the Marsh Kingdom, but that doesn't stop her from aligning herself with Kul of Fens to get her retribution. Synopsis: Jon and Burke set off to thwart the plan of madman Satan Rex, who seeks to destroy the Earth by throwing it off its orbit, and into the path of the Sun. Synopsis: ASfter mopping up crime in the "City of Rackets", Speed decides to take a well deserved vacation: with Reel, as they explore a cave beyond the one Speed uses as a base of operations and which carries them back in time. As they travel down a road, they are challenged to do battle with Ten Knights of Doom. Synopsis: A scientist invents a super atom bombarder, which can harness the energy of 10,000,000,000,000,000 atoms per second, and will cause the Earth to spin around 1400 times as fast, causing one day to pass every minute. The ignoramus the scientist is explaining this to doesn't really understand the concept, but wonders what effect the device will have on people. Advertisement (1 page) Act Now On This Bargain Offer.